1. The Practice of Community/Society: Shambhala is a community that practices the teachings on basic goodness, and explores and develops a culture within our communities that embodies that profound principle. Membership offers active engagement in contemplating and building a different kind of society altogether. Learn more on the Shambhala Vision page. 2. Meditation Practice: A member of Shambhala makes a connection to mindfulness-awareness practice, and works to integrate that practice into daily life in order to create a foundation for healthy social relationships and an enlightened society. This connection may also be made through contemplative practices based on mindfulness-awareness. Learn more on the Meditation page. 3. Volunteer Service: A large majority of Shambhala activities are conducted by volunteers, and there are many ways to help. Members donate time to the local centre based on their interests and personal availability. Learn more on the Volunteering page. 4. 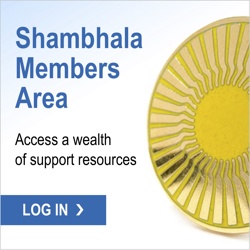 Financial Support: Shambhala is sustained through dues and donations. When you become a member, your financial contributions support the maintenance and growth of our centre as well as the international Shambhala community. Learn more on the Membership Dues page. If you have any questions about membership, please contact Susan McConnell at bodhithaye@gmail.com. To become a member please complete the Membership Form. Once we receive your completed form, Susan will guide you through the new member orientation process.